Ha 57 HRC (edge hardness). 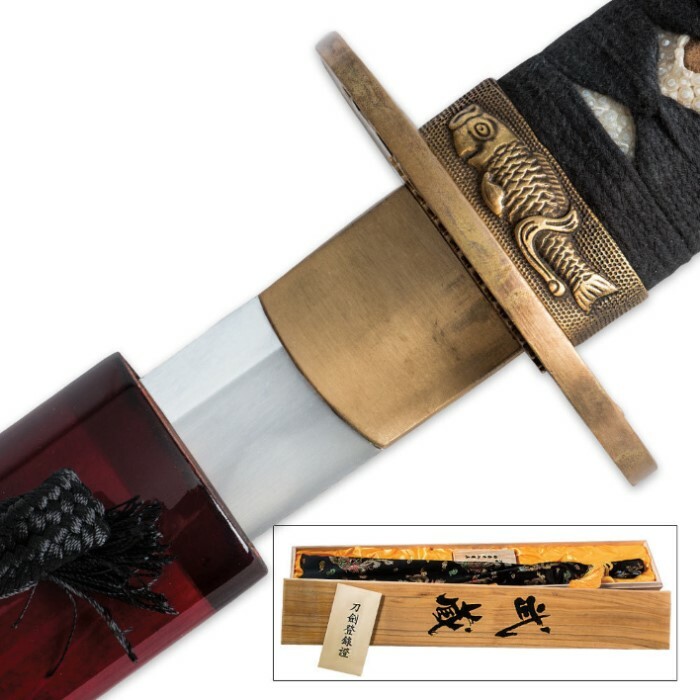 Blown away, to describe this sword in detail, would take pages of writing, and even then justice could not be done to this beautiful piece of art. The menuki is a piece of art in itself, depicting a sakura flower. The tsuba, although in my opinion, slightly on the plain side adds another layer of beauty, and is the perfect size (at least for my hands). this is not some machined replica, this was hand made for this blade and fits in very well, and is very secure. The sageo (cord wrap) is made of high quality black rope that looks like an over sized shoe lace, and is secured tightly to the saya. The saya is a deep burgundy red color, and has a high gloss finish that is very reflective. very attractive. The sword is very blade heavy, but that just adds to the cutting potential of the extremely sharp blade. The kissaki is very well defined. Also, im not sure whether this is a pro or a con, but there is no hi (blood groove) on the blade. 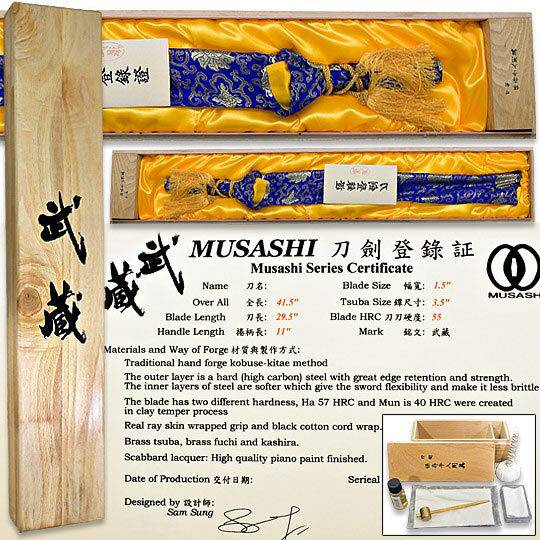 The box containing the sword and cleaning kit seems o be made of pine, and looks great for a display box. 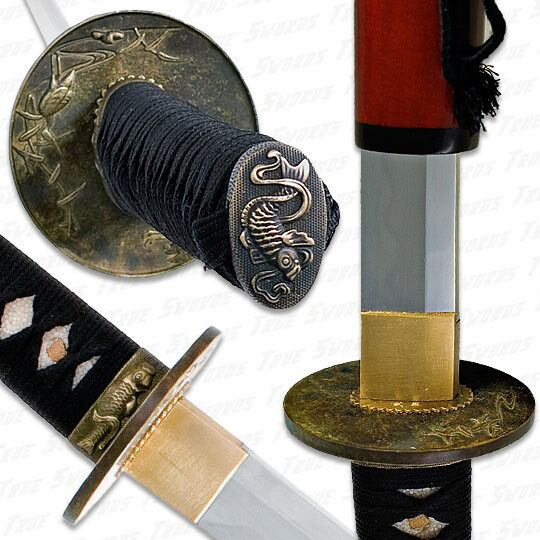 Delivery was extremely fast at only two days (and im in California), and True Swords kept up to there promises, by only delivering the best of the best at-the best prices around. I am very satisfied, and i will be back for more. Thank you True Swords for yet another amazing product! This sword is absolutely amazing. 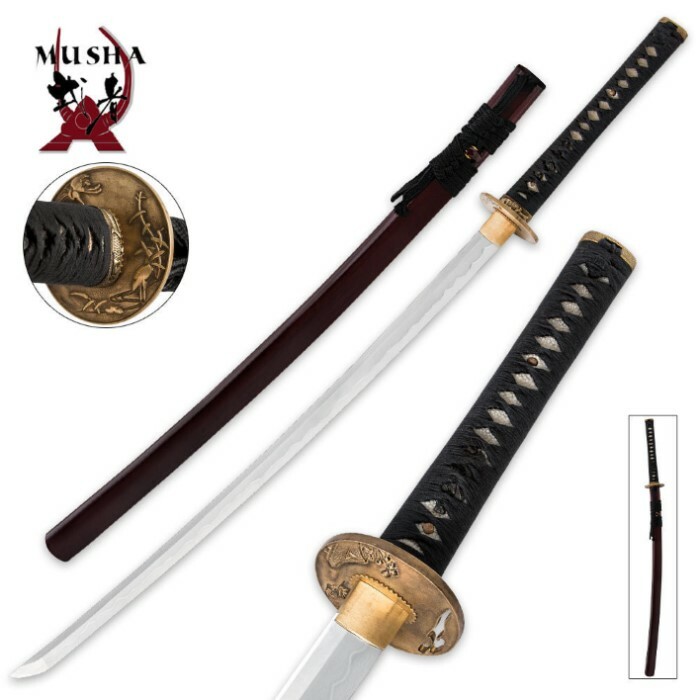 Most people write Musashi off as a sub-par brand however, this blade is on and above what I was expecting. First off the wrap is very tight and very well done. The gaps are completely symmetrical on each side and neither side will slide about at all, even when attempted forcefully. 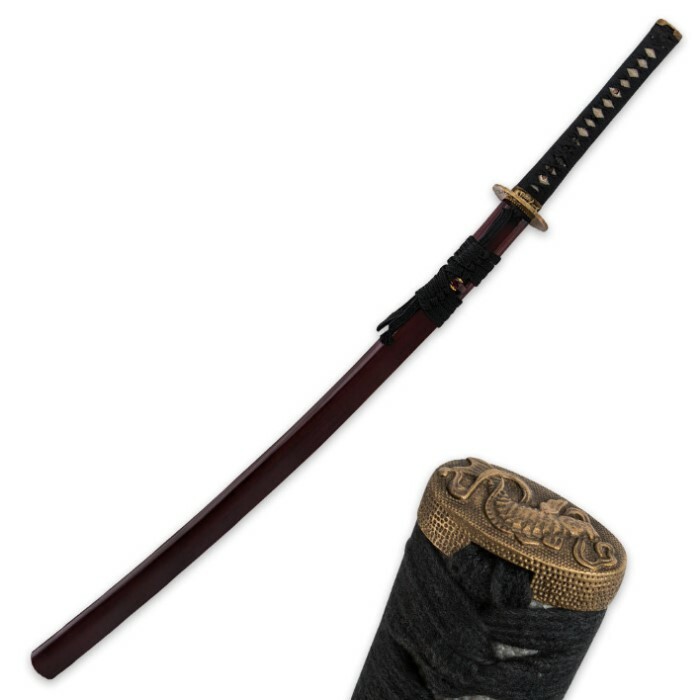 The saya is a beautiful deep red.The blade has a prominent hamon and is EXTREMELY sharp. You can, upon close examination, even see the individual folds in the steel itself. It effortlessly cut through two side by side gallon jugs with (literally) only a flick of the wrist (all I have to test with at the moment). The sword bag and cleaning kit are also well made, they don't feel cheap. The certificate and the envelope it is in are made of an interesting textured paper. The box is nothing to be too excited about, considering it is made of a very light wood and the satin appears to be sewn onto Styrofoam. Still though aesthetically pleasing. The fittings are impressive and solid. All in all, I would say that it is defiantly a great buy. Call me crazy but I would probably choose this sword as opposed to the practical series if heading into combat, but that may just be a personal bias.